I would like to introduce you to #WORK2WIN, a first of its kind Academic and Athletic Consulting Firm for Student-Athletes. As the new school year Begins, Parents and Student-Athletes alike are faced with tons of hurdles, questions and decisions that distract and discourage your child from reaching their goals and their full potential. For Student-Athletes, there is no time to waste! Freshmen only have 2-3 years before college applications and their athletic recruitment begins. 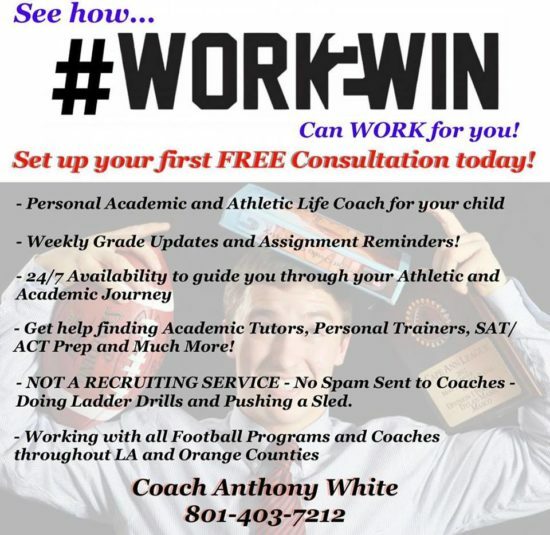 #WORK2WIN works alongside Parents and Student-Athletes daily as their own personal Life Coach to manage and monitor your Child’s EVERYDAY Student-Athlete Life! Including: Academics, Athletics, Personal Training, Diet, Academic Tutoring, SAT/ACT Prep, Counseling, Career Advice and More! We have a Staff of Coaches, Teachers, Counselors, Tutors, and Personal Trainers to guide our Families and Student-Athletes to the Next Level and beyond! For those that know me, know I have always been about Success ON and OFF the field as well as making sure my Student-Athletes have as many options as possible after High School. My staff and I have former athletes today playing in the NFL, D-I, FCS, D-II, D-III, and NAIA and we also have a variety of past High School Student-Athletes that are attending colleges throughout the nation on Academic Scholarships. For a small monthly fee – You and your Child will receive Weekly Grade Updates for ALL Academic Classes, Highlight Video Assistance, Personal Meetings to go over the Individual Progress Towards Goals, 24/7 Consulting for any Athletic or Academic situation and Much More! We are NOT a Recruiting Service. WE build our program around your Child’s On and Off the Field GOALS, that makes attaining a Scholarship a simple part of the program, not the end goal. We work in conjunction with your current team and coaches as to never conflict with any practices or activities they may have. This program only works with 100% Brutal Honesty, Dedication and Hard Work daily. Parent and Student-Athlete References are readily available if needed. I look forward to hearing from you to set up your personal consultation to see how #WORK2WIN – can work for YOU! 25 Comments to "Work 2 Win is Here"
Lol! Take a hike clown! My school gets trolled all day and I respond and your feelings get hurt? Like I’ve said before, if you don’t like it then don’t read it…You fail to realize that this isn’t about my school. It’s about cheating the system. That’s why all these kids will not be playing this year. Break the rules and get caught. Pay the consequences. If you think I’m happy about it then you’re wrong. Only ones that suffer are these kids. I feel bad for the kids that transferred to schurr and lost their SR year of playing high school ball! The parents and coaches should’ve kept it on the “hush hush”. Instead, the coaches went around town bragging about how many studs they got coming in and saying “This team is going to be better then last year’s team”. It also doesn’t help when you’re meeting with the Offense Coordinator and other coaches from schurr at Rios pizza( in Montebello) and talking about your “7 on 7” team. Saying how much they would benefit by joining them at Schurr. Adults are taking advantage of kids for the benefit of winning! I’m all for transferring (my son transferred from schurr to Garfield after his freshmen season) Just make sure you do it right and that the coaching staff is up front with what could happen if you don’t follow the rule book! Stop being a tool! You’re the problem with society today, always full of drama, and believing the louder, ruder, and more obnoxious you are, you win the argument. Put more of your energy in to your team, demand they play with the passion you have for the drama! @Oiler Nation & @Duane B. You guys made my morning! The constant banter, loved it!!! Thank you very much. Can’t wait to leave work and head off to football practice. A moron, I didn’t do anything to anyone. They did it themselves. Why are saying that I did it? You must be the biggest Village Idiot around. If you think that I have that kind of pool with CIF then thanks. Go have another cheeseburger you clown…. From Duane B.: First, your comments haven’t gotten approved yet because some of us aren’t constantly on here obsessing over transfers and trying to get the last word in on everything! I have a lot of better things to do than sit here a wait for one of you insightful comments to arrive! Second, I never said you did anything! You did! You wanted us to run a story about at the time were a bunch of rumors. I asked if you wanted the rumors from both side and you said “you won’t be hurting my feelings.” That infers that your name might come up in the rumors. At this point what I am failing to understand is that if Tim and I are such A-holes because we won’t cater to your deep desire to have us post a story that does nobody any good, why do you keep coming back? All your posturing and name calling isn’t going to convince us to do anything. Oh, and as far as another cheesburger goes…great idea! You buying? From Duane B.: Who cares what we think? Oh, I don’t know, maybe the people who click on the Mid Valley to the tune of close to 100k page views each month! As far as me having something to say, I no longer have to say it. You saying that I won’t hurt your feelings says it all. You must be really proud of yourself! Why not post your real name and tell everyone what you did take down the big bad school on the hill. That way you can get all the accolades you deserve! @Olier Nation: Only Schurr and Buena Park? You missed it bad on this one. I’ve also been accused of being a homer for Temple City, Monrovia, La Canada, San Marino, Arroyo, El Monte, So. El Monte, Mt. View, Rosemead, Alhambra, Montebello- Yes your Oilers- just ask Pete, Bell Gardens, Santa Fe, La Serna, Cal, La Mirada, Norwalk, San Dimas, Baldwin Park, Northview, San Gabriel, South Hills, Arcadia, Crescenta Valley, Burbank, Burroughs, Muir, etc. etc. I’m proud of it though…great coverage. Homer is such an old, tired, word. Does anybody even use it anymore? You’re new to this site so I’ll give you a break but man…geez…get better rookie! From T. Peterson: Yeah you’re right it was. Get better. From Duane B: Did this comment get deleted? Why report on rumors? Who benefits from that? Sorry to disappoint you but we are not in the business to ruin people’s reputations. If we were in the rumor business, we would also report the rumors we heard about who whined to CIF. You want those rumors too? It’s seriously time for people to grow up and stop acting like they got their lollipop stolen! The it’s in the first sentence that was fixed after my post. Ex post facto. From T. Peterson: No nothing there. I guess you just missed this one. Good try. Love the fact that you delete comments against anything/anyone you guys don’t agree with. This “blog” has become an embarrassment and a joke! From T. Peterson: So is the comment directed at me or the Mid? – you need to make up your mind there. We delete the comments when they take personal shots or are nonsensical. Your last one covered both. Actually I deleted it to save you the embarrassment because it was so juvenile and ridiculous, so you’re welcome. As far as being a joke we have more hits than ever, especially with football season. In fact It’s just hard to keep up when we’re working 50 plus hours a week at our other jobs. Thanks for the clicks every day. Most, if not all college programs offer both athletic and academic counseling for FREE to its players. This include JC’s. I am lamenting the fact that a college education isn’t paying off for the majority of attendees, yet this expensive endeavor is being pumped as the only way forward, in this case by Anthony White. A big student loan debt combined with home prices in the stratosphere don’t bode well for the future of today’s kids. A first of its kind academic and athletic consulting firm that does not know the proper usage of ‘it’s’. From T. Peterson: What are you talking about? @Agreed, sorry for all the lost opportunities in your life. Hopefully, you can teach others about your mistakes. Lesson #1, don’t be bitter at other’s success. Typical HS has 2000 students and 4-5 Counselors. Lack of Talent? Lack of Knowledge? Or lack of …..? He says it’s free to get a meeting. Ha, isn’t this what school counselors are for? Yeah, what about the next forty years? They are likely to be spent paying-off the outrageous student loan debt that Anthony White prepared you to assume, all the while still living with your parents. From T. Peterson: And who’s fault would that be? It says “Coach” Anthony White… where’s he coaching? It’s not about the next four years. It’s about the next FORTY years!